A dear e-mail friend of mine who lives near NYC loves the ballet passionately. In early December she kindly sent me a link to a slide show of Henry Leutwyler photos of the New York City Ballet on the Vanity Fair web site. As I perused the photos, sitting in my pajamas at the computer, I came across one that took my breath away: two photos, side by side, of two pairs of ballerina feet on pointe at the wall, each with one toe shoe on, the other without. This exquisite duet reveals the actual toes in their bandaged and/or wounded glory. You can see this (literally) achingly beautiful portrait here. The morning I sat at my computer in my jammies and looked at all these photos, marveling at their precision and beauty, and the precision and beauty of those being photographed in their work, two volunteer students from the University of Idaho had showed up to split wood for me out in my barn. There had been a sudden ice-sleet-rain-snow-thunderstorm the previous evening (which Romeo and I had got caught in by surprise), and the temperature had not risen above freezing since then. But I was still mostly unaware of the practical consequences of this as I ate my bowl of oats and fruit, absorbed in the world of the ballerina. I am certainly not a consoisseur of ballet, but, like many people, I have been to and enjoyed The Nutcracker several times in my life. And my little sister took ballet for a while, and one of my mother’s students went on to be a professional dancer, so I’ve been in the audience perhaps a little bit more than most people. I loved the movie The Turning Point way back when. As a grad student I was fascinated by sections of Frank Bidart’s long poem “The War of Vaslav Nijinsky,” when I heard them read out loud during a reading Bidart gave on our campus. And, for a time in my professional life, I was a writing counselor who helped dance majors write their papers on dance history. It was here I learned who George Balachine was, and what his contribution to technique in ballet was. I can still see the student whose paper was a mess explain to me very clearly, with shining eyes, what this meant in the history of dance. It was my window into helping her writing become as clear as the understanding she was sharing with me. I also remember a moment early in my life, perhaps watching the Russian dancers in the Nutcracker, of feeling how thrilling it must be to be able to jump like that; it required the kind of balance and extension my mild CP made illusive. But I had the understanding that performers need an audience. And if I couldn’t do it, I could certainly share in it by being the audience who loved and appreciated such beautiful and precise physical movements. I was saturated with such memories as I began to dress in the layers required to take the dog and I out for our walk. I could still hear the axe falling on the chopping block now and then. I happened to open the shutters in my bedroom just before putting my coat on. 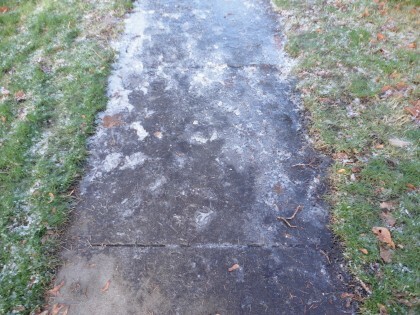 It was then I saw the ice frozen in pools on the low sidewalk along the front of my house. And I saw instantly how that day, December 8, would be the first day for ice cleats this season. If it was like this right out in front of my house, it was also going to be like this on the trail along the creek. Or worse. The moment had come to stretch the ice cleats over my boots once again. With their tiny blue tungsten nails, they are, in a way, my own unique and quirky version of “on pointe.” It’s a strange feeling to get used to, since once on, my feet do not really touch the ground. 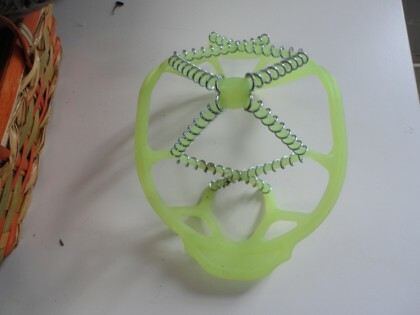 The tiny teeth are so strong that I am actually walking on those points the whole time the cleats are on, so the tread in my boots becomes irrelevant, as can the feel of the ground to my feet. Yet the feel of the ground to my feet isn’t irrelevant. It’s the key to stability. One of the hardest things about walking on ice for me is convincing myself to let my feet continue to try and feel the slippery ground. But on the way back home as I completed a circuit about a mile long, some of the going was especially rough. I was getting tired. It was hard not to fret about falling. And admonish myself. At this point Ketut’s smile meditation morphed into a memory of a wonderful story my friend Irene had told me about when our boys were each about 4, a time before we knew each other through their friendship, or even lived in the same state. Her youngest son, Greg, had been acting out-of-control goofy in a restaurant, and she had had it. She took him out to the car, sat him down on the seat with the car door open, and began telling him he needed to straighten up in a commanding voice, complete with finger wagging in his face. His 4 year old response to his mother getting into his face was to take her face in his hands and plant a big kiss right on her mouth. Talk about diffusing a power struggle. Every time I think of this I still laugh, because it is so perfect a solution to all fretting and worrying and laying down the law. So that got me the rest of the way home. This first time out, I had done well. But I was wiped out enough from the extra effort to lay down on the couch with Romeo and take a short breather. Even getting those cleats stretched onto the boots is, for me, well, a literal stretch. As in, hard for my hands to do. And once I do get them on, they put pressure on the toes that the boots aren’t designed to disperse. So after a while, that is tiring too. Like having your toes in the box of a toe shoe might feel, I imagine. And sometimes, trudging through slush and ice that’s melting, the slickness of that gradually works the cleat too far off the bottom of the boot. The conditions have to be just “right,” and thankfully they rarely are, but once it went flying off and split in two. The moisture and rising temperature were just too much for it. Since the short break of clear ground between the ice of early December and the week before Christmas, we’ve had pretty consistent snow on the ground. 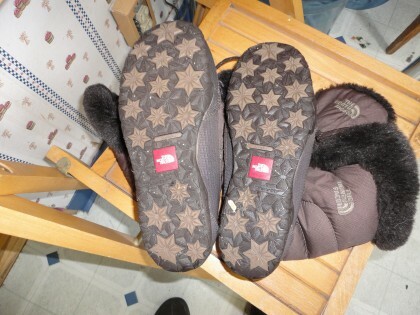 When there’s snow and ice, my snow boots with the “star” tread on the bottom are my “go to” footwear. They are soft and warm as can be. A neighbor once said they look like sleeping bags for feet, but I prefer to think of them as “cute,” the word my son used when he first saw them a few years ago. I’d like to say they are vegan, but I can’t. I was thrilled to be avoiding leather, but later discovered I had missed the fact that they are filled with down. Finding vegan snow boots and outer wear that actually work to support my specialized needs in extreme conditions is a challenge I haven’t succeeded at fully meeting yet. It’s turning out to be a very gradual process. Non-vegan uppers notwithstanding, I love walking with the help of the “stars.” They grip the combination of snow, ice and slush like nothing else. And I can feel my feet on the ground. Sometimes this makes them sore (that long walk on the beach in bare feet effect) but overall it is great exercise, and this year I am happy to report my feet feel more sure than ever. I am grateful beyond words that I was somehow “given” the grace and patience to find eating this way, and thus also find the way to melt those layers of icy fatigue, slowly but surely, from “underneath.” And gradually, to negotiate the physical ice that once seemed the perfect metaphor for the layers of locked up stamina I couldn’t access. These days, I’m out every day, no matter what. Romeo and I walk at least a mile, often more, unless the weather conditions are very extreme and prevent it. In three years, that’s been less than what I can count on one hand. Maybe this year if I continue to think of negotiating the ice as a kind of ballet, I will remember there’s beauty in discipline, form, and even limitation. That even when I feel as if I must be “on my toes” at all times, or, more precisely, endure the scrunching of my toes in order to walk on little nails, spirals or stars in order to make my way step by step, I can still touch the earth with my feet every day. Even when it’s frozen. And for me, that’s a blessing beyond compare. I love your spirit. I too have had alot of feet problem in the past year and a half … so I get where you are coming from. They say my arch fell on my left foot and I’ve had plantar fasciitis on both. I’ve spent hundreds of dollars trying to find a shoe other than a tennis shoe. I get Weird looks at work but hey… We gotta do what we gotta do. Hi Christi! Thanks for the lovely comment, and for sharing some of your own “footsteps.” Here’s to comfortable shoes that take loving care of our tootsies! Hi Maria- my wife and I live in Georgia and while ice is a very rare occurrence in our area, last year, we got about 10″ of snow. It melted and froze and our neighborhood became a huge skating rink. I told my wife that I’d handle dog-walking duties for the week since she’s a bit unsteady on her feet. I slipped on my pair of (Walking) YakTrax and gingerly went outside. No problem. I walked a bit. No problem. I went back and got the dog and walked to the end of the (steep-ish) driveway. No problem. I walked our dog three times a day that week and not once did I feel unstable or about to fall or anything. Heck, I even would jog with them and never experienced a problem. Parting funny(? ): On the last day of that week, my wife said, “I’ll take the dog out.” So she headed outside, carefully avoiding any icy remnants and walked toward our next-door-neighbor’s house. Hi Andy! Thanks for sharing your story about ice in Georgia! Sounds like you did great. Here’s to being armed with the proper tools, both metaphorical and literal! Oh, Maria! Those pictures brought back memories and choked me up. I was a ballerina throughout my childhood until I thankfully became too tall and my hips became too wide. The worst part is taking your point shoes off. My toes are quite long and my slippers would therefore always be filled with blood. The wood would be sticky with sweat and blood and I would cry as I unwound the bandages and dunked my feet into the ice bath, watching the water turn pink and wishing they’d go numb quickly while i scrubbed the black practice slippers with peroxide and fels naptha. Those pretty pink slippers don’t last long, we’d only wear them for a few productions before they were too soiled. I have a lot of respect for the men and women who dance professionally, it is definitely an endurance sport. Though I stopped dancing as a teen my toes are pretty messed up and my feet do hurt a lot when the weather is cold. Good thing there’s no snow around here! Ouch – those ballerina feet hurt to look at! And yet so graceful underneath it all. I well remember the difficulty navigating ice and snow in winters back east, and have often imagined how much harder it would be if I lived there now. Very glad that the necessity of ice-walking is an easier task for you now. 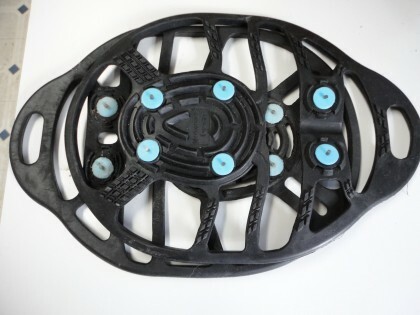 I never heard of ice cleats, though I grew up in Philly and lived in Massachusetts for a number of years and they might have come in handy! But they sound useful. I bet they would have, Robbi! Thanks for stopping by. Hi Maria: Just slowly coming back from the flu and have used this low energy day to just stay comfy and doing things that make me feel better. Reading your blog does both! I have missed all your January posts until today, so, it’s been kind of like reading a book of short stories – but better for the recipes! I love the one on rainbow chard and you’ve given us such good links in that too. It also made me feel good – that though I have been on soups only for weeks now – I have been packing them with greens, like kale, chard and spinach. Another amazing thing I learned is you may have grown up in or frequented my old neighborhood in Sacramento. I was reading about your sadness that your January birthday excluded you from holding the party at Fairytale Land and that even the best ice cream parlor was closed that month. I almost feel out of my bed – when I read Vic’s. Seeing that I then I knew you were talking about Land Park! this is exactly where I had my house until 2008, just blocks north of Vic’s on Vallejo Street. Some of the extra padding on my body comes from Vics for sure! Anyway – I am thrilled that you must have grown up in an area I know well and one that hardly changes a bit over time – so your childhood landmark’s are mine decades and decades later!!! I loved my little Tudor style cottage there and it’s roomy garden. I had such high hopes of having the best veggie, herb and cutting garden there eventually – no such luck though. Hi Michelle–So very nice to hear reading my blog is good comfort medicine for you as you recover. I hope you are all the way “back” soon. And good for you to be having so much soup! I smiled so broadly and then laughed to read that you lived on Vallejo–I remember that street!! And I really laughed to read you had put on “some extra padding” from Vic’s!! Wow, we have Land Park in common. I never actually lived in that neighborhood but wanted to. My Mom wanted to as well. There was once a house for sale on Brockway Court–a rather large Tudor style house with a spiral staircase that I once went to see with her. She couldn’t convince my father to buy and “older” home, and she always felt sad about it–especially after prices skyrocketed!! So nice to share the place with you. 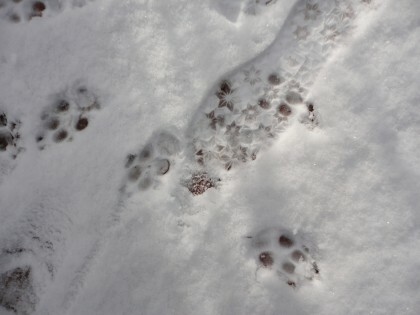 🙂 And thanks for enjoying the photo of our “prints” in the snow!! Hugs back!